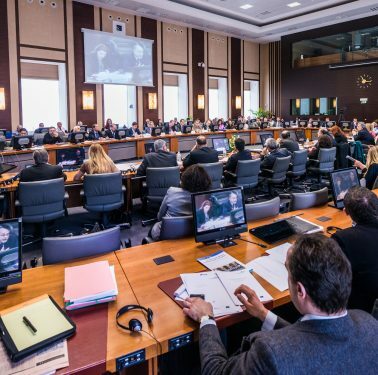 EuroMeSCo contributes to the EU Global Strategy On the occasion of the EuroMeSCo Annual Conference 2016, held in Brussels on 14-15 April, more than 150 experts and policy makers from 30 countries gathered to discuss the current security situation in the Mediterranean. EuroMeSCo network welcomes six new members The 2016 EuroMeSCo General Assembly, held in Brussels on 13 April, saw the entry into the network of six new institutes. 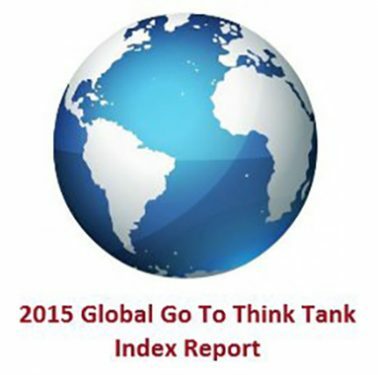 The EuroMeSCo ranked among 10 best think tank networks in the world The EuroMeSCo network of think tanks on politics and security in the Mediterranean reaffirmed its position among the world´s top 10 thank tanks network, according to University of Pennsylvania´s 2015 “Global Go To Think Tanks Ranking”. Working Packages for the second cycle of the project approved The meeting of the EuroMeSCo ENI Project´s Consortium took place on 9 December in Brussels. Members of the consortium, Steering Committee and representatives of the European Commission and the European External Action Service discussed the topics of the Working Packages for the second cycle of the project. 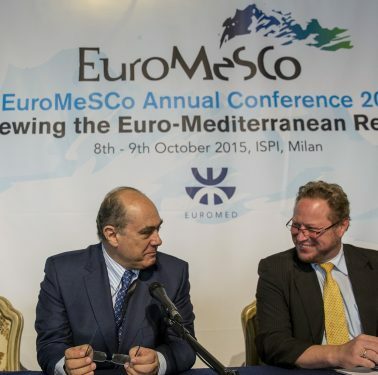 EuroMeSCo network welcomes new members The 2015 General Assembly, held in Milan on 8-9 October, saw the entry into the network of four new institutes. Official launch of the EuroMeSCo ENI Project A milestone event for EuroMeSCo ENI Project “Euro-Mediterranean Political Research and Dialogue for Inclusive Policymaking Processes and Dissemination through Network Participation” took place on 8 October in Milan, in the framework of the EuroMeSCo Annual Conference 2015. EuroMeSCo contributes to the reflection on the ENP revision The EuroMeSCo network held its annual conference on 8-9 October. The event was organised in Milan in partnership with the Italian Institute for International Political Studies (ISPI). Kick off meeting of the EuroMeSCo ENI Project On 20 April, a kick off meeting of the EuroMeSCo Eni Project took place in Brussels. The meeting counted with the participation of Irène Mingasson, Head of Unit of Regional Programmes Neighbourhood South at DG NEAR. 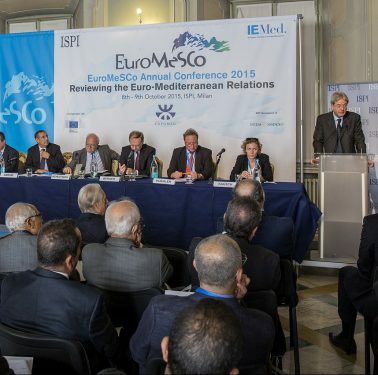 The European Commission will support the EuroMeSCo network The European Institute of the Mediterranean (IEMed), together with 13 co-applicants and a pool of associated institutes from the EuroMeSCo network, has been awarded a grant from the European Commission to develop the project “Euro-Mediterranean Political Research and Dialogue for Inclusive Policymaking Processes and Dissemination through Network Participation”.